"You gotta have a purpose!" 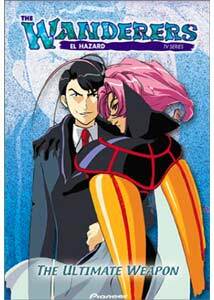 El Hazard: The Wanderers #2: The Ultimate Weapon is the second DVD volume (episodes 8 through 13) of the anime TV series set in the mystical world of El Hazard. Our hero, Makoto Mizuhara (voiced by Tetsuya Iwanaga), is aided by his rough-shaven sensei and friend, Mr. Fujisawa (Koji Ishii), his childhood friend and potential girlfriend Nanami (Rio Natsuki), and a silly but wise chibi girl named Alielle (Etsuko Kozakura). All are ostensibly trying to find their way back to Earth (Makoto's science experiment having gone awry), but the episodes in this collection focus on the friends' attempts to adjust to the culture of their temporary homeland. Nanami develops her catering business, Makoto tries to find his purpose in life, and Mr. Fujisawa kicks back while resisting the romantic attentions of the beautiful Miz Mishtal (Saeko Shimazu). Meanwhile, Makoto's rival Jinnai has joined with the Bugrom, an insectoid army, and is determined to overthrow the peaceful kingdom. It's always difficult to jump into a series partway through, but the character designs and performances here are instantly appealing (if a little bit clichéd). Makoto is an earnest young man, wrestling with adolescent issues of identity and blissfully unaware of the feelings he inspires in at least three attractive young women. Mr. Fujisawa is the ultimate slacker, though he rises to the occasion when a fight erupts (a rarer occurrence here than in many anime series). Nanami is cute and a bit of a tomboy, Alielle is bouncy and cheerful, and the kingdom's Princess Rune is kind-hearted and sensitive. The Japanese voice performances are very solid, and the animation is limited but effective, with some nice special effects, subtle character moments, and none of that newfangled CG stuff. The series is set in a fairy-tale version of the Middle East, an Arabian Nights desert kingdom with plenty of room for mythical beasts, powerful elemental forces, and beautiful shrines, though the series' creators never allow the visuals to overpower the relationships. The interpersonal elements are given time to develop—we get to know these characters without having to keep up with rapid-fire plot twists, and the pacing enhances the experience significantly. These are simple, exciting but light-hearted stories, with an old-fashioned sense of serial adventure about them. There are some violent moments and hints of "fan service," but nothing blatant or graphic—think Terry and the Pirates rather than La Blue Girl. Episode #8, Reunion, brings the main characters together again after a brief separation; they return to the "Sacred Palace of Water," only to find that the shrine has been turned into a water park by its twin caretakers! Episode #9, House of Thieves, briefly recaps the characters' backgrounds, then pits our heroes against the ruthless Jinnai. His Bugrom accomplices have been stealing all of the farmers' vegetables, threatening El Hazard with economic disaster and starvation. But Makoto's knowledge of chemistry proves an invaluable aid. Episode #10, The Jungle Beast, concerns the titular creature's attacks on a local village. Princess Rune sneaks out to join our heroes as they confront the gigantic wolf/dog creature and acquire a catlike animal companion named Ura in the process. Episode #11, A Child's Heart, is the simplest and most touching episode in this collection. Working at an orphanage for a few days, Makoto and the Princess try to deal with a bratty girl named Millie and learn of her disturbing past; there's also a hilariously exaggerated "baby pee" gag involving Mr. Fujisawa. Episode #13, Pure Evil Genius, in which the 'Devil,' a clockwork girl named Ifurita, struggles with her inherent good nature and the evil commands of her master, Jinnai. Our heroes join together in a mighty but inconclusive struggle. The episode ends with the threat temporarily defused, but one suspects further complications will arise in the next DVD volume. Image Transfer Review: El Hazard: The Wanderers is again presented in its original 1.33:1 full-frame made for TV aspect ratio. The framing occasionally seems too tight, losing some of the image to overscan on most monitors, and there's a bit of digital compression blocking in a few darker shots. The video-mastered transfer exhibits false-color aliasing and scan-line shimmer now and then, and there are some unusual production artifacts—vertical "bobbing" afflicts a number of shots, cel scratches and glares are common, and at one point a hair appears in the camera gate. But the transfer to DVD is generally solid, with clean edges and bright colors. Not reference quality, but a nice-looking transfer given the mid-nineties videotape source. Audio Transfer Review: Pioneer presents The Wanderers #2 in its original format, encoded as Dolby Digital 2.0 Surround audio on DVD. It's a very clean, high-quality soundtrack, with some very effective imaging across the front soundstage and substantial bass when it's called for. Surround usage is rare (perhaps unintentional), and the frequency and dynamic range aren't up to feature film standards, but the original Japanese audio track sounds great on DVD (especially those all-important, insanely catchy opening and closing themes). As usual, I found the Japanese voice acting highly preferable to the English dub—the original performances are thoroughly committed and wonderfully over-the-top, while the English actors sound vaguely embarrassed by the whole thing. Still, it's nice to have both options, a definite DVD-era advantage over the sub-OR-dub VHS days. Extras Review: Pioneer supports El Hazard: The Wanderers #2 with 30 chapter stops (5 per episode) and a few standard anime extras. The Non-Credit Opening #1 and Non-Credit Closing segments provide an unobstructed view of the series' opening and closing sequences—there are some fun little moments that are easy to miss when the credits are rolling, and this feature is much appreciated. A brief, six-image gallery includes six publicity stills from the show, all standard promo shots, no cel setups or other value-added material. A single screen of DVD credits lists those responsible for the DVD release. The clear plastic keepcase features a reversible insert with alternate artwork. Oddly, there are no time stamps provided during the program—the times listed in this review are approximate. El Hazard: The Wanderers #2: The Ultimate Weapon continues the anime adventures of Makoto, Nanami, Alielle and friends in the mystical land of El Hazard. Pioneer's DVD features a decent transfer and solid audio, and the story is good old-fashioned fun. Worth checking out.